September 29, 2014 – A new image of Saturn obtained by the Cassini spacecraft was released today. The latest image shows the planet’s many cloud patterns, swept along by high-speed winds. 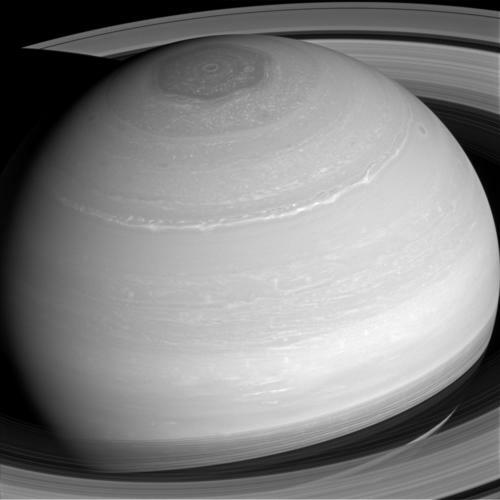 With no real surface features to slow them down, wind speeds on Saturn can top 1,100 mph (1,800 kph), more than four times the top speeds on Earth. The image was taken with the Cassini spacecraft wide-angle camera on April 4, 2014 using a spectral filter which preferentially admits wavelengths of near-infrared light centered at 752 nanometers. This view looks toward the sunlit side of the rings from about 29 degrees above the ringplane and was obtained at a distance of approximately 1.1 million miles (1.8 million kilometers) from Saturn. Image scale is 68 miles (109 kilometers) per pixel. Cassini was launched on a Lockheed Martin-built Air Force Titan IV/Centaur rocket on October 15, 1997 with the European Space Agency’s Huygen’s probe. The Cassini-Hyugens mission was designed to study Saturn, it’s majestic rings and its 31 known moons. The mission represents the technical efforts of 260 scientists from the United States and 17 European nations. The spacecraft dropped into orbit around the ringed planet on July 1, 2004. Originally planned for four years of orbital science investigations, the mission has been extended several times, and ten years after its arrival at Saturn, the spacecraft is still healthy. The current mission, called the Cassini Solstice, goes through September 2017. The Hyugens probe was equipped with six instruments to study Titan, Saturn’s largest moon. It landed on Titan’s surface on January 14, 2005 and returned spectacular results. Meanwhile, Cassini’s 12 instruments, one of which was designed and built by the Laboratory for Atmospheric and Space Physics in Boulder, have returned a daily stream of data from Saturn’s system since arriving at Saturn. The Imaging Science Subsystem, or Cassini’s cameras, have been photographing a wide variety of targets – Saturn, the rings, Titan and the icy moons – from a broad range of observing distances for various scientific purposes. General science objectives include studying the atmospheres of Saturn and Titan, the rings of Saturn and their interactions with the planet’s moons and the surface characteristics of the moons, including Titan. The instrument includes both a narrow-angle and a wide-angle camera. The narrow-angle camera provides high resolution images of targets of interest, while the wide-angle camera provides more extended spatial coverage at lower resolution. The cameras can also obtain optical navigation frames, images of Saturn’s moons against a star background, which are used to keep the spacecraft on the correct trajectory. The Cassini-Huygens mission is a cooperative project of NASA, the European Space Agency and the Italian Space Agency. The Jet Propulsion Laboatory, a division of the California Insitute of Technology in Pasadena, manages the mission for NASA’s Science Mission Directorate, Washington, D.C. The major U.S. contractor was Lockheed Martin, whose contributions include the launch vehicle and upper stage, spacecraft propulsion module and the radioisotope thermo-electric generators. The Cassini orbiter and its two onboard cameras were designed, developed and assembled at JPL. The imaging operations center is based at the Space Science Institute in Boulder, Colorado. Carolyn Porco is the leader of the imaging science team and will also be an imaging scientist on the New Horizons mission to Pluto.